Jim Borax founded California Cabaret because he loved the ‘great standards’. Jim turned his attention to reviving an appreciation of a popular musical art form, the Broadway Sing-along. 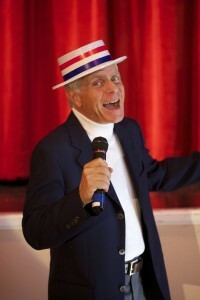 His audience participation entertainment is a favorite at private parties, country clubs and fund raisers. Musical support for the program is provided by a swingin’ 3 piece band and written lyrics are distributed to everyone in the audience. In 2005 Jim expanded his entertainment to present talented singers & dancers who perform memorable Broadway show tunes and classic standards. For more information about the entertainers please visit The Entertainers Page. His entertainment has been featured on CNN, CBS TV and the L.A. Times. For further information, contact Jim Borax, Emcee, California Cabaret, (760) 278-1577.